Hydroseeding is an excellent option for adding grass to your property, especially if you have a large area to cover. While sod provides immediate results, it takes time to lay it down and there is always the chance that it won’t take and grow roots like it should. 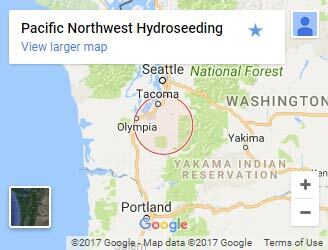 Eliminate this possibility by choosingPacific Northwest Hydroseeding for Hydroseeding in Puyallup. These grass seeds start to grow quickly and with a fraction of the labor laying sod requires. And when you see how effective our work is, you’ll know that our hydroseeding is the go-to method! What’s the typical process to hydroseed a lawn? When you choose us for hydroseeding, we try to make everything as simple as possible. And we’re happy to work with your whether you know exactly what you want or need us to guide you from start to finish. We come onsite and prepare the ground for the hydroseed mixture. We use a mixture of 3 types of Perrenial Ryegrass, Chewing Fescue, and Red Fescue. Next, we use the hydroseeder and have one of our experienced technicians apply the slurry all over the area where you want it. Because growing a lawn doesn’t always work as expected, many companies don’t offer a warranty. We do. If your lawn doesn’t grow with proper after care, we’ll come back and respray it–free of charge! Hydroseeding is a complicated process and should only be handled by professionals. And we’re just the professionals that you need. We stand by our estimates and are happy to answer any questions that you have. And we’ll make sure you’re satisfied with our work. 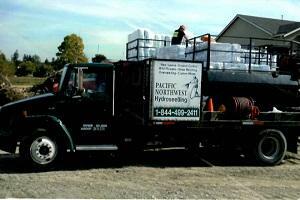 Give us a call or contact us today for a free estimate on hydroseeding in Puyallup.